Wine bottles can be a fun accent in a small space. 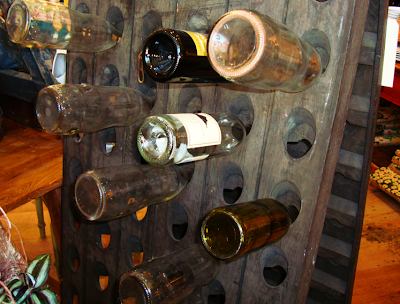 I have featured a few different leaning wine racks before and spotted yet another riddling rack at Anthropolgie. While still pricey at $200, these racks can cost upwards to $400 in vintage shoppes so do some research before you go for it. 1 Response to "SMALL SPACE ACCENTS: Showcasing Wine"
I love the wine rack. I love how rustic it is!